This Sphygmomanometer is a precision instrument, which has been constructed to withstand normal shocks in handling. Although its construction is rugged for an instrument so sensitive, it is still a fine instrument and should be accorded care in use. 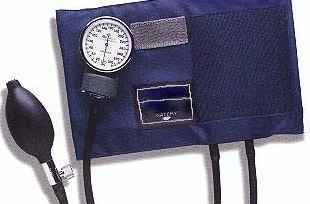 The method of determining human blood pressure with this Sphygmomanometer is based upon procedure recommended by the Committee of the American Heart Association. The patient may either be in a lying position or be comfortably seated. The patient should be placed at ease and time should be allowed for recovery from any unusual recent exercise or apprehension. Blood pressure determination should not be made after recent meals. The arm should be bared and care should be taken to avoid any constriction of the arm by clothing or other interfering articles. The arm should then be slightly flexed and relaxed. In the sitting position the forearm should be supported at heart level on a smooth surface. The hand may be pronated or supinated, depending upon which position is found to yield the clearest sounds. This instruction begins with specific directions for the Standard BP Monitor ( Gauge and Inflation Bulb on separate Tubes). If you have a 1-Hand Model (INCLUDING ADAPTOR VERSION OF STANDARD BP MONITOR) the assembly is already complete and you should just go ahead per 2nd sentence with application of the cuff/bag to the arm. Assemble Valve with Bulb to long tube of bag and the Manometer to the short tube. The deflated bag and cuff should be applied evenly and snugly but not too tightly around the arm with the lower cuff edge about one inch above the antecubital space and with the rubber bag over the inner aspect of the arm directly over the brachial artery. If the veins of the forearm are prominently filled or if there is evidence of congestion, the cuff should be applied while the arm is elevated in order to promote venous drainage. The manometer should then be slipped onto the loop on the top of the cuff by means of the two prongs on the spring clip. SYSTOLIC: A stethoscope receiver should be applied snugly over the artery in the antecubital space, free from contact with the cuff. The pressure in the sphygmomanometer should then be raised rapidly and decreased slowly as in the palpatory method, until a sound is heard with each heartbeat. Note the reading as systolic pressure. DIASTOLIC: with continued deflation of the system below systolic pressure at a rate of 2 to 3 mmHg per heartbeat, the sounds undergo changes in intensity and quality. As the cuff pressure approaches diastolic, the sounds often become dull and muffled quite suddenly and finally cease. The point of cessation is the best index of diastolic pressure. Taking your BP at HOME is HEALTHIER for you! See the MABIS - GERMAN 1-HAND $61 - list price over $99.